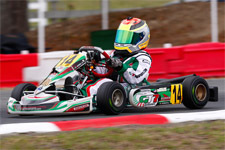 Kicking his 2015 season off with a Vortex ROK power plant bolted to his Tony Kart chassis for the first time ever, Gangi Jr. would struggle to find the speed in both Saturday and Sunday morning qualifying sessions. 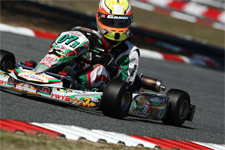 Constantly working with his crew and on his equipment, the multi-time karting champion would improve throughout both days of wheel-to-wheel competition. Saturday would see the up-and-coming driver qualify 17th, drive forward six positions in the prefinal to finish 11th and then another spot in the main event to come home tenth. 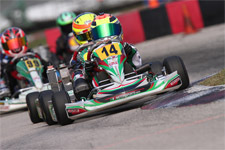 Sunday would see Gangi Jr. maintain his 20th place qualifying position in the prefinal before jumping into the top-ten with a ninth place result in the day’s main event. 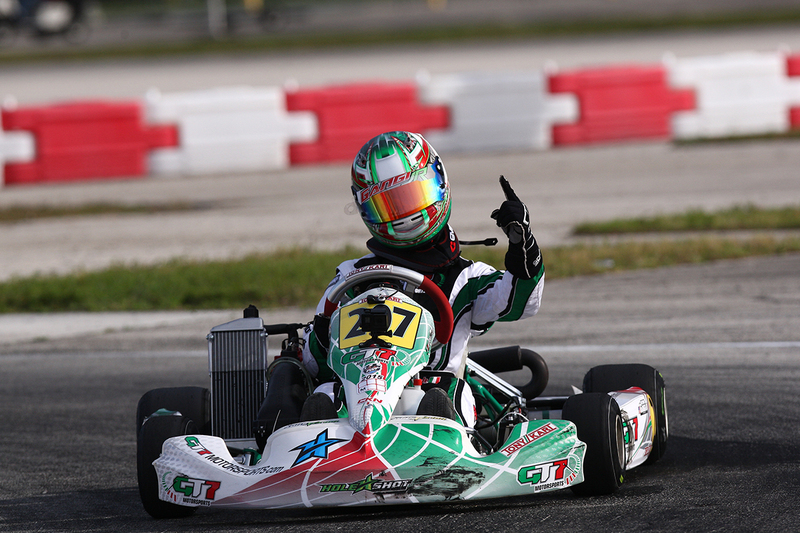 Back to the grounds of the famed Homestead-Miami Speedway the following weekend, Gangi Jr. would trade his Vortex ROK engine in for his much more familiar Rotax Junior package and quickly found himself at the front of the pack by showing speed in Thursday’s unofficial practice sessions. Friday afternoon would bring qualifying for the nearly 200 competitors, and Gangi Jr. would battle a full field of talented juniors for the elusive pole position. Qualifying for Sunday’s wheel-to-wheel action first, the Tony Kart driver would turn a very respectable lap to start his prefinal from inside row four in the seventh position. Later that day the Rotax Junior field would do it all over again for Saturday’s competition and the ever-popular driver would find himself at the tail end of the top-ten on the outside of row five. Determined to prove his speed and showcase his race craft, Gangi Jr. did so in both Saturday and Sunday’s prefinal races. Saturday would see the GT7 Motorsports driver drive from tenth to fourth in the prefinal. Moving up to second in the final, accidental contact from behind sent him down the running order to 22nd, with Gangi Jr. eventually making his way back up to the 12th place. Sunday would prove to be a much better day. Gangi Jr. would drive from the seventh position to the front of the field in his prefinal where he would secure his first heat race win of the season. With the win, Gangi Jr. claimed the all important pole position for the afternoon’s main event. 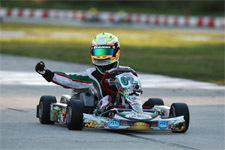 Taking the point at the drop of the green flag and never looking back, Gangi Jr. drove a smart and consistent race to become the Rotax Junior victor by a 3.3 second margin. Fist pumping as he crossed the line, Gangi Jr. was stoked to start the 2015 season off on the right foot. Next up for Gangi Jr. is a trip to the Orlando Kart Center in Orlando, Florida for the second stop of the tour. 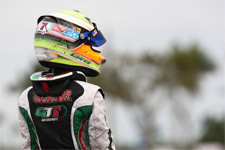 Taking on the ROK Cup USA weekend February 21-22, the multi-time champ will be back for more racing the following weekend, February 27-March 1 for the Rotax MAX Challenge rounds three and four. Anthony Gangi Jr. is also pleased to announce Mike Doty of Mike Doty Racing as his full time driver coach and tuner for the 2015 season. 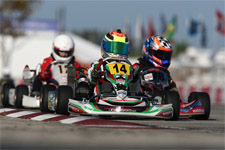 With Doty mentoring and coaching the young driver since Gangi Jr. first started in the karting ranks at the age of seven, and the duo working together for his SuperNats victory in 2012, Doty will now partner with Gangi Jr. full time in 2015. Anthony Gangi Jr. would like to thank everyone involved for helping make the start of his 2015 season a success: Team GT7, tuner/driving coach Mike Doty of Mike Doty Racing, Chad Brackens of Race Data Dynamics for all the data support, Daniel Lambert (Disco Dan) for the always-great power, Daniel and Gary Woltjer of Woltjer Engines, as well as sponsors GT7 Motorsports, Millwork Solutions, Hole Shot Drive Systems, PKT, and Hot Head Engine Preheaters.